When registering Technology Bloggers Technorati account, I thought what a great idea it would be for me to tell you how you can claim you blog with Technorati too. Why should you bother claiming your blog? Well there are a number of very good reasons as to why you should! The first is that it gives your blog some form of protection against content theft. If Technorati spiders your site and registers your latest content, and then hours later someone reposts your content claiming it as their own, you can use Technorati as your proof that the content is yours. Technorati is also known as a “blog search engine” so if you are submitted to it and someone is looking for a blog like yours, yours might just come up! 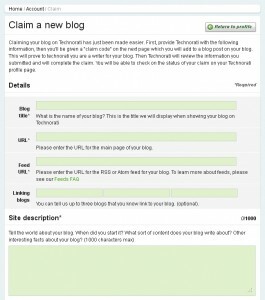 How Do I Claim My Blog With Technorati? Ever found yourself asking that question, or asking yourself that question now? Well it’s very simple. Just register for your free account, then scroll down to the bit that says “My claimed blogs” and enter your blog URL in the “Start a blog claim:” box and click claim! Then you will be given a code (probably by email) that you have to publish on your blog. Technology Bloggers code is MKZMCFEAWAME – yours will probably something of similar length, just random (to you and I but not to Technorati) letters. Technorati will then spider your blog until it finds the code. 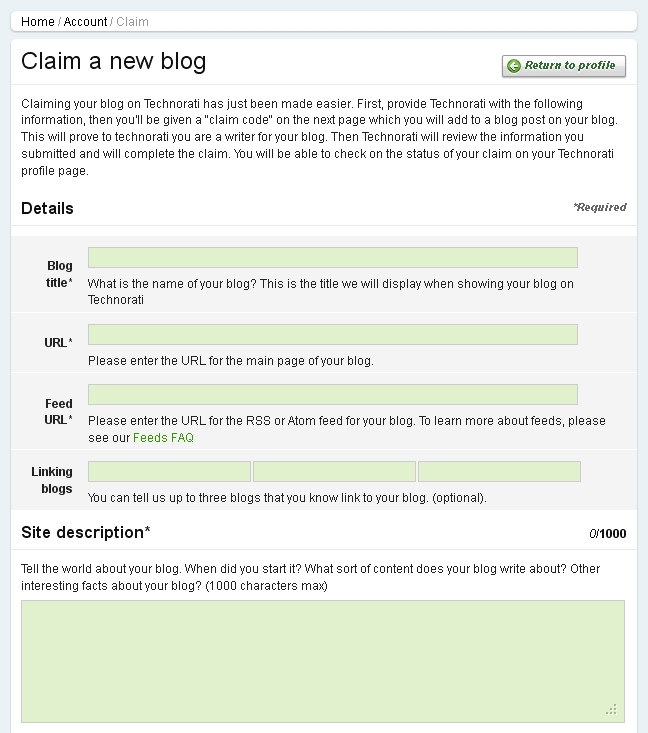 Usually your blog then has to be reviewed by someone at Technorati, and after that it is registered to you! You will then be able to see what rank and authority it gains, and other people will be able to search for it.